Description: On this episode, Laura Chandler is joined by author and Tibetan Buddhist teacher, Lama Tsultrim Allione. Lama Tsultrim is currently on a European book tour to support her latest book, Wisdom Rising: Journey into the Mandala of the Empowered Feminine. In this conversation, Lama Tsultrim talks about the mandala practices in her book and her focus on making certain practices of Tibetan Buddhism relevant and impactful for contemporary practitioners. She also addresses many current political and spiritual topics, including sexual misconduct by spiritual teachers, the #metoo movement, and the role of women spiritual teachers in Tibetan Buddhism. Lama Tsultrim is one of the preeminent American teachers of Tibetan Buddhism. 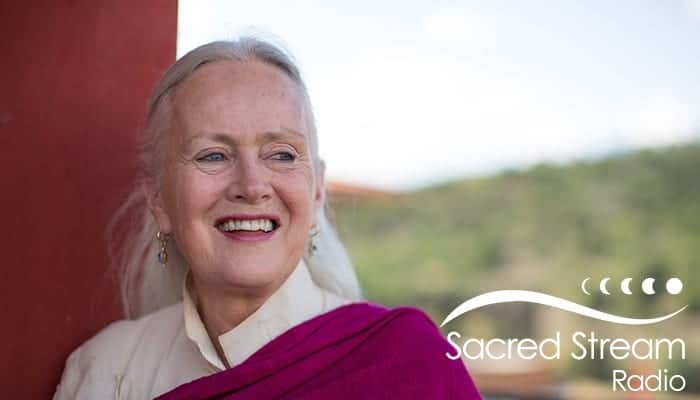 Her interest in Buddhism began as a teenager, and in the early 1970s, she visited Nepal and backpacked across India, befriending Ram Dass and eventually becoming Allen Ginsburg’s meditation teacher for a time. At age 22, she became the first American ordained by H.H. the 16th Karmapa, and has studied with and received transmissions from many of the great masters of Tibetan Buddhism. Lama Tsultrim is recognized as an emanation of the 11th Century yogini, Machig Labdron, who developed several Tibetan lineages of the Vajrajana practice of Chod. Lama Tsultrim resides at her retreat center, Tara Mandala, in Pagosa Springs, Colorado, which she founded to help preserve and pass on the teachings that she has spent over fifty years studying. For more information about Lama Tsultrim and Tara Mandala, visit taramandala.org. Our featured musical artist is the prolific, Grammy-nominated singer-songwriter and multi-instrumentalist, Barbara Higbie.